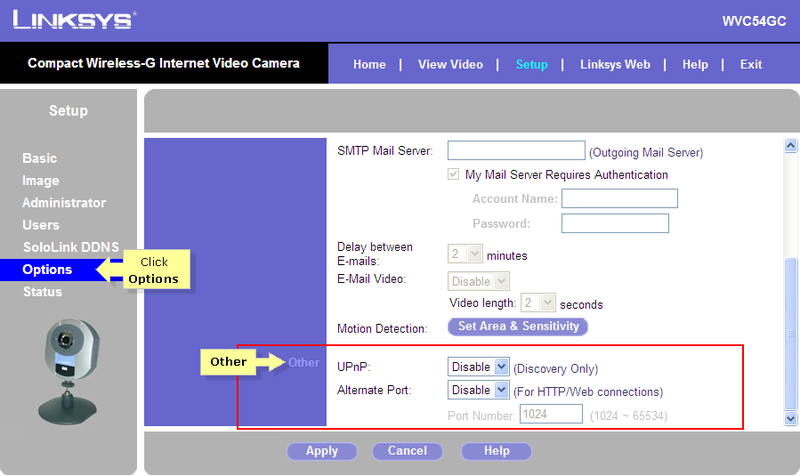 This article will provide instructions on how to access your camera remotely by assigning it a port number and using the port forwarding function on your Linksys router. This process must be done on your Linksys router. Access the camera's web-based utility by a web browser. To learn how to do this using a Windows computer, click here. If you’re using a Mac computer, click here. On the left-hand side of the Setup page, click Options and scroll down to the Other category. 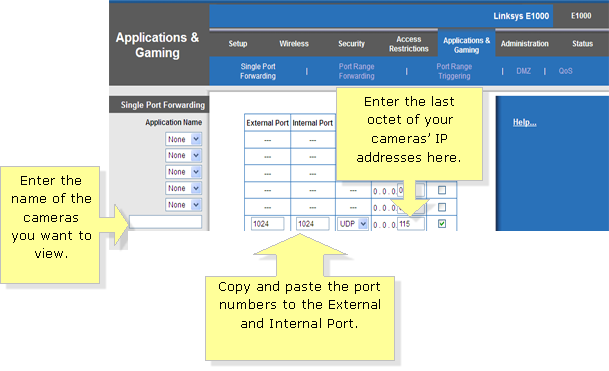 Choose Enable from the drop-down menu for Alternate Port and enter any Port Number value between 1024 and 65534. NOTE: You now have a port number for your Wireless-G Camera which will allow you to have it forwarded on your Linksys router. Access the web-based setup page of your router. To learn how, click here. • External and internal port – copy the port number value you assigned to your camera from the camera’s web-based setup page. • To IP Address – enter the last octet of your cameras’ Static IP address here. NOTE: Set the Protocol to UDP and click the checkbox under the Enabled column. After completing all the necessary entries, click the button. Click Continue on the confirmation screen. NOTE: After setting-up port forwarding on your Linksys router, connect the router to your modem for the devices to have online connection.